As a compact, powerful controller, XL4 can be used in literally thousands of applications from Machines to Mobile and Process Control Applications. High-speed Ethernet, CANBus and Modbus options offer you the perfect networking mix. The XL Series comes with a wide range of field installable add-on communications options. You can select from the following: 10/100MBit Ethernet, GSM/GPRS cellular, telephone modem and radio modems. 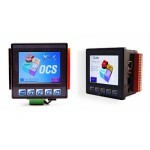 All options support remote Cscape™ programming, Modbus master and slave and OPC. The GSM/GPRS cellular also support Modbus/TCP slave. A GPS receiver unit is also available for mobile applications. XL4 supports CsCAN or CANopen high-speed networking and Ethernet as a standard. Single-point-of-connect (only CsCAN) allows seamless communications between the PC running Cscape or our PC visualisation software Envision and any controller. As a compact, powerful controller, the XL4 can be used in literally thousands of applications. From OEM machine control to machine monitoring in a plant environment, the XL Series can be instrumental in keeping you or your customer's automation activities running smoothly. Future expansion is not a concern because the XL4 is part of the wide-ranging OCS product line - programmable throughout with a single FREE software package, Cscape™. XL4 - Our Most Advanced 1⁄4 DIN All-in-one Controller The XL4 All-in-One controller with a bui.. WIDE ASPECT COLOR TOUCHSCREEN The X5 really packs a big picture into an overall small package. Wi..